This is a delicious Bakewell/almond flapjack recipe with a hidden layer of jam and dried fruit, finished off with an oat crumble. I incorporated in the yummy Urban Fruit dried cherries. They give a lovely chewy texture to these flapjacks whilst adding in an extra burst of cherry flavour. 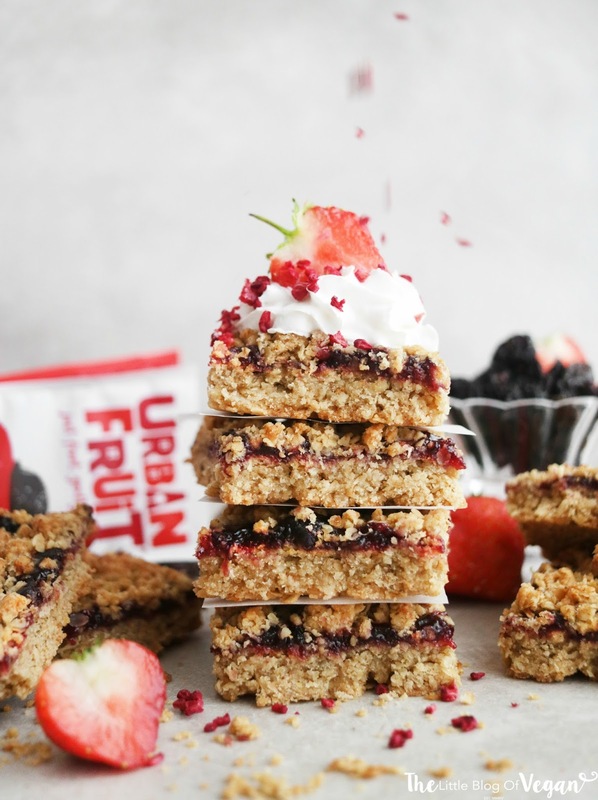 Urban fruit makes some of the most delicious dried fruits and coconut chips. All of their products are 100% vegan, natural and are baked. Flapjacks are the perfect 'on the go' snack. Bakewell is an almond based dessert which usually consists of jam & flaked almonds in a tart or cake, but the divine flavours go so well with oats. I wanted to boost the almond flavour in these flapjacks, hence why I used ground almonds, almond extract and flaked almonds! Step 1- Pre-heat your oven to 180degrees and line a baking tray with grease proof paper. Step 2- Put the oats, ground almonds and flour into a large mixing bowl. Step 3- Melt the margarine and maple syrup together in a small saucepan on the hob. Pour into the dry mixture and mix together until combined, then stir in 2 tablespoons of almond extract! Step 4- Spoon half of the mixture and firmly press into your lined baking tray. Make sure to get right into the edges. Step 5- Spread 3 large tablespoons of jam over the oat layer and press in some of the Urban Fruit dried fruit (optional). Step 6- Place the other half of the oat mixture on top of the jam and level with a cold spoon or your hands and firmly press. Sprinkle over some flaked almonds for added flavour & texture. Step 7- Pop the tray into the middle of the pre-heated oven and leave to bake for 20 minutes. Step 8- Once golden brown, remove the tray from the oven and place onto a cooling rack to fully cool down! Step 9- Slice the flapjack into squares and place them into the fridge and allow the topping to set. 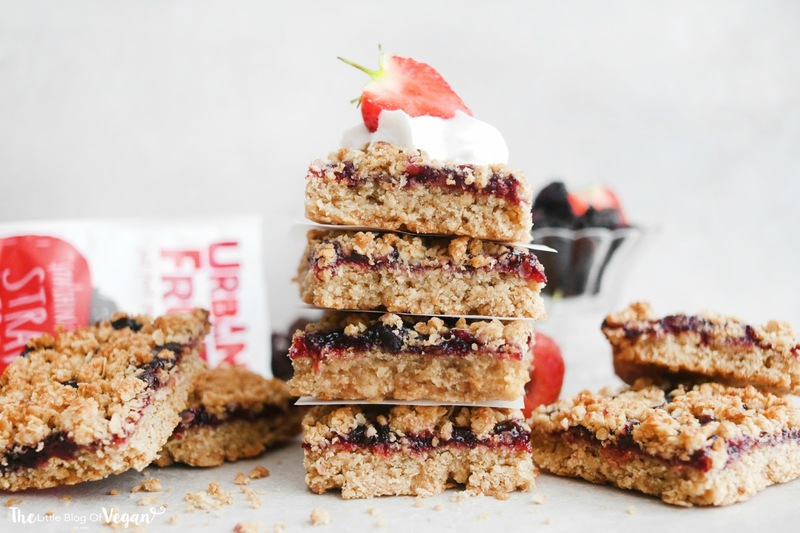 A huge thankyou to Urban fruit for collabing on this recipe with me! Can you put pin it buttons on your posts so people can save your recipes for later?